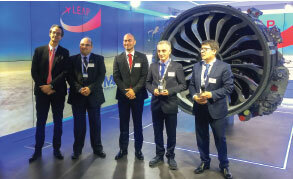 TEI received the ‘Best Business Partner’ award from SAFRAN Aircraft Engines for its contribution to the LEAP Together Project at the Paris Air Show, which is one of the world’s most prestigious aviation fairs. TEI, thanks to its qualified workforce, comprehensive and advanced manufacturing capabilities and the importance it attaches to quality, was selected as the best business partner by SAFRAN Aircraft Engines, which is one of the two main manufacturers of the LEAP engine (the world’s most preferred next-generation commercial engine) together with GE Aviation under the roof of CFM International. TEI Manufacturing Director Mr. Murat Karamahmutoğlu received the award from Safran CEO Mr. Oliver Andries on behalf of TEI at the ceremony. Having participated in the Fair, having taken place between 19-25 June for the 9th time, TEI unveiled its two-stage turbocharged diesel engine PD170 and Turkey’s first national turboshaft engine TS1400 during the exhibition. The 5-stage compressor blisks were also displayed. These blisks were manufactured by TEI for the world’s most preferred next-generation commercial engine LEAP, of which TEI is the biggest supplier.